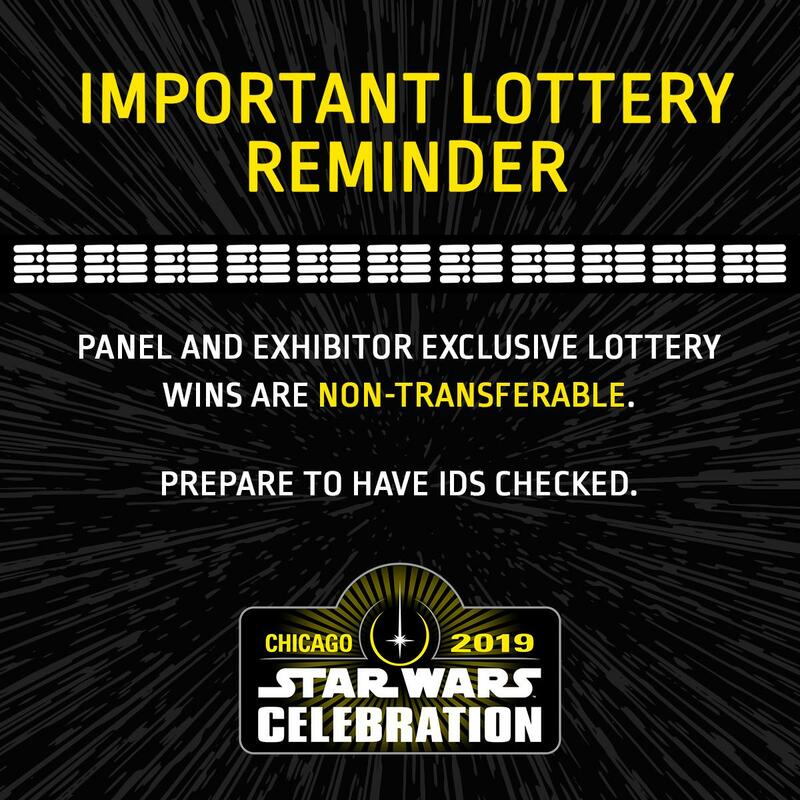 Yes, the info online says those panels would be considered full while the rejection emails say "If any lottery winners are not able to attend the panel those seats will be released for advance panel reservations in the official Star Wars Celebration Mobile App." Anybody have an extra Ep IX or Galaxy's Edge ticket? Can potentially trade Mandalorian overflow. I'm confused as to how ReedPop didn't make sure only authorized badges could enter the lotteries. 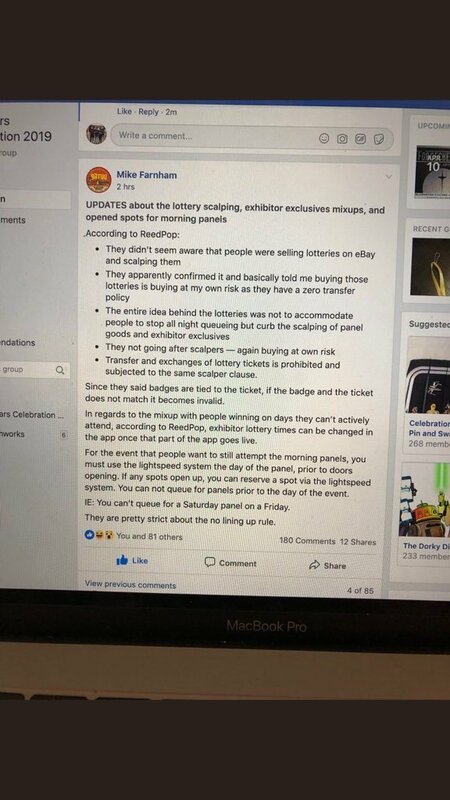 I've heard reports of people with single-day badges winning lotteries for days they don't have a badge for. SDCC 2015, 2016, 2017, 2018, 2019 || Star Wars Celebration 2017, 2019. Meanwhile, noticed the Android app seems to have lost the panel queuing from the update now, under My Benefits. I only have a Saturday ticket...does anyone know when the panel reservation system will open so I can try again for the big panel of the morning? I didn't win a lottery spot. I don’t think you can use that for the big panel. Only for the others. The first panel of each day is lottery only. Well, drat. 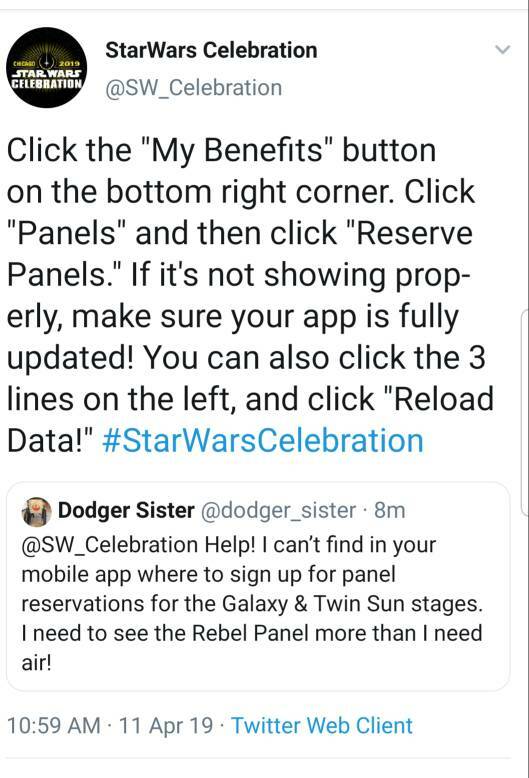 I do know a person would have to reserve before the panel (or shopping line) is happening, I was wondering when the app lets that day's panels show up to put a reservation in. Like, if it is that day, is it open at midnight, 6 am, 2 hours before, etc.? I am assuming that if you have the 5 day ticket that you can only reserve one day at a time? #LEGO , I love you! Just received an email saying they will honor all lottery winners who received a pick-up time on days they didn’t have a badge!! #StarWarsCelebration thank you @LEGO_Group !!!!!! 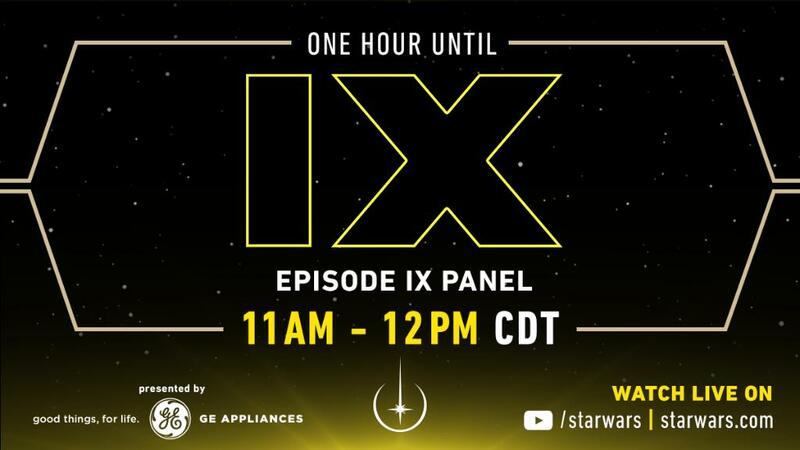 In one hour, join us for the Star Wars: Episode IX panel live from #StarWarsCelebration, presented by @GE_Appliances. Tune-in at 11am CDT on You are not allowed to view links. Register or Login or You are not allowed to view links. Register or Login . edit: looks like it's been removed from CWK site, although other versions are searchable on YT. was there more shown at the panel? ILM Presents: Making Solo (from Friday)? Short Stories with Warwick Davis? Edit: here's a Twitter thread with links to a few of the other panels at SWCC.